MediaTek will be growing its presence in Singpore with a new office at One North. MediaTek will also invest more than than $94 million (120 million SGD) to expand its research and development center and business operations in Singapore. “We are pleased that MediaTek, Asia’s largest fabless semiconductor company, has chosen to expand its operations in Singapore. This will further strengthen our semiconductor ecosystem, which comprises of many major IC design companies, foundries, and assembly and test houses. Besides generating spin-offs to Singapore-based semiconductor manufacturers, MediaTek‘s partnerships with local research centers such as VIRTUS at the Nanyang Technological University, will further strengthen our pool of analog and RF IC design talent,” said Leo Yip, chairman, Singapore Economic Development Board (EDB). “MediaTek started its Singapore operations with seven people in 2004 and quickly expanded to today’s team of more than 150 employees. I am pleased to announce that we plan to further double our team strength over the next few years and greatly expand our research and development operations here. Additionally, Singapore will now be MediaTek‘s regional base for RF design. MediaTek‘s increased investment in Singapore is driven by the country’s distinctive assets, including a multicultural mix of world-class talent, easy logistics for Southeast Asia and the world, and a well-functioning business environment. 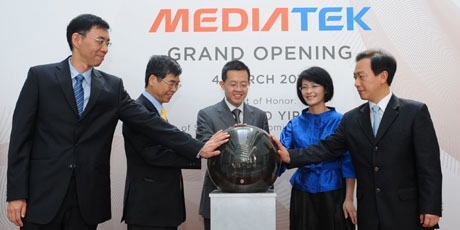 By expanding in Singapore, MediaTek is even better positioned to grow our mobile business in the region and beyond,” according to Ming-Kai Tsai, chairman and CEO of MediaTek. To show its long term local commitment, MediaTek is also an active patron of education in Singapore. A MediaTek Joint Industry Program provides scholarships to students for postgraduate studies in the field of IC design. “Our commitment to Singapore also includes investments in the education sector. Thus, we are also pleased to announce that MediaTek will further contribute to and collaborate with leading institutions in Singapore,” continued Tsai. This entry was posted in Technology, Wireless, Work and tagged Asia, baseband, cellphone, cellular, chipset, communication, 無線通訊, 研發, EDB, 聯發科, 類比, Fabless, handset, IC design, Mediatek, modem, MTK, Nanyang Technological University, NTU, Research, RF IC, semiconductor, Singapore, Singapore Economic Development Board, Taiwan, VIRTUS, Wireless, 南洋科技大學, 南亞, 台灣, 射頻, 新加坡, 晶片設計, 亞洲. Bookmark the permalink.